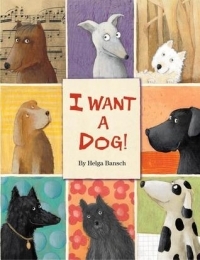 Books Kids Fiction I Want a Dog! Every child wants a dog at some point. Here's the story of little girl who figures out how to get what she wants! Lisa Can't Fulfill Her Dream . . .Or Can She? In a winning combination of story and illustration, we meet Lisa, whose most deeply held dream is to have a pet dog of her very own. She loves all kinds of pooches, which we get to see in the adorable illustrations of "BIG dogs, small dogs, short dogs . . ." and more. Lisa's parents say she cannot have a dog because their apartment is too small. Meanwhile, people give Lisa all kinds of dog knickknacks, which do not satisfy Lisa's canine craving one single bit. At night Lisa dreams of dogs; during the day she tries all kinds of unsuccessful maneuvers to acquire one. But finally Lisa has a brainstorm--and it proves to be the perfect, most heartwarming solution for everyone. I adore a good dog story (and extra credit for one that doesn't make me sob and take to my bed in heartbroken agony). I WANT A DOG! is a beautiful book with absolutely wonderful illustrations that manage to be both poignant and, at times, hilarious. Those pictures are the just-right accompaniment to this charming tale of how one girl manages to solve her problem with a little work and a lot of creativity. Highly recommended.